Rezekne Academy of Technologies (RTA) is a state founded university type higher education institution with unlimited international accreditation. Its roots go back to 1925. Record sheets starting from 1 August 1925. The aim of RTA is to provide academic and professional higher education in compliance with the science development level and cultural traditions of Latvia being competitive in the European education space, developing studies and research in 14 study fields. The mission of RTA is to provide an opportunity to achieve academic and professional higher education, do fundamental and applied research in educational science, humanities and arts, social science, information and communication sciences, engineering, manufacturing and construction. 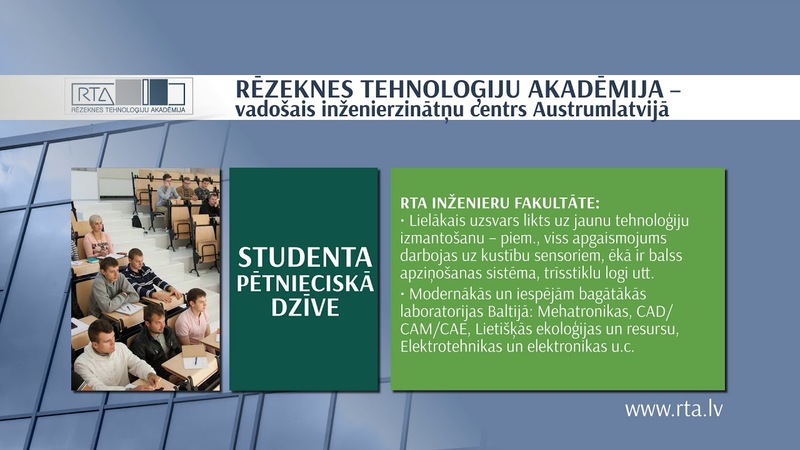 RTA offers to achieve knowledge in faculties of Economic and Management, Engineering and Education, Language and Design, more than 50 Bachelor, Master, and Doctoral study programmes in Latvian and 14 programmes in English. RTA also provides studies in Livani and Madona branches. Scientific research is carried out in accordance with Law On Scientific Activity and the Statute on scientific activity in RTA, approved by RTA Senate. RTA has Research Institute for Regional Studies and six research centres. RTA implements several projects co-financed by the EU programmes, involving academic and general staff and students. RTA manages several international cooperation projects and national programmes. RTA regularly organises local and international conferences. RTA has more than 185 cooperation partners from 31 country and thus promotes high mobility of academic staff and students (2nd-3rd place among all higher education institutions of Latvia). There are students from Uzbekistan, Kazakhstan, Georgia, India, Sri Lanka, Bangladesh, Lithuania, Finland, Belarus, Saudi Arabia and other countries studying in RTA. Students of RTA have diverse opportunities to develop their talents. We have a dance group “Dziga”, drama group “ĶerRA”, and mixed choir “Sonitum”.Students actively participate in faculties self-government, as well as in the Student Council, realizing various initiatives. Centre for Lifelong Learning (CLL) is a department of RTA. Its goal is to promote lifelong learning, ensuring the continuation of previously acquired education and development of education according to the requirements of the labour market and personal interests. CLL offers foreign partners traineeships and further education programmes in English and Russian. To promote excellence, RTA has founded Eastern Latvia Technology High School in 2015. The school provides STEM oriented education.